Monsoon 101: Bath & Body Products To Help You Survive Monsoon! Ladies, we understand how annoying period mood swings can be and this little bottle of relief is what you need. This PMS oil from Raw Home essentials comes in small roller bottle filled with various essential oils and is 100% natural. Best part? It’s easy to carry and smells fabulous. Monsoon hair care is one difficult job but with the right products you can rock any look. We absolutely loved the Jatamansi Taila oil that consist of natural ingredients such as Almond Oil and Kalonji Oil soaked in Ayurvedic herbs like Jatamansi, Amla, Methi and more. This magical oil will control hair fall, prevent dandruff, and fungal infections that creep in without you noticing. Add this to your daily hair care routine and you are good to go! 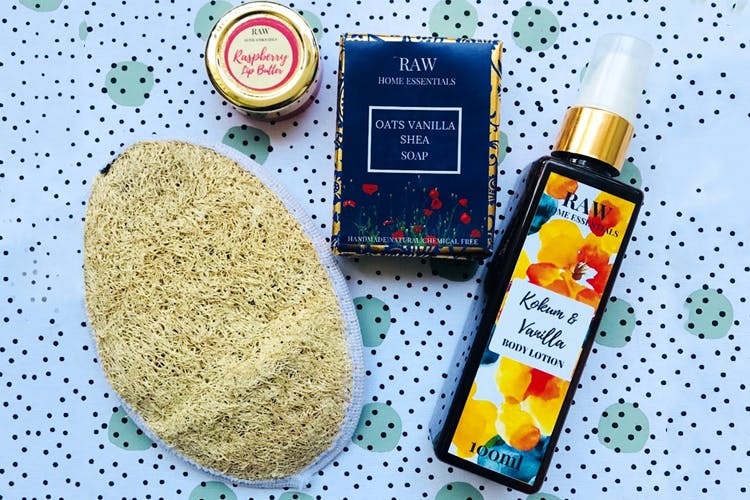 Say goodbye to those gloomy monsoon mornings with this Raw Home Essentials bathing combo. This combo includes oats vanilla and shea butter soap, perfect to keep your skin moisturized and helps in exfoliating too. Second is an organic loofah minus any synthetic fibres and goes very well on any kind of skin. The Kokum and vanilla lotion is both smooth will keep your skin hydrated the fragrance is super pleasing. Lastly, the lip butter is compact and made using ingredients like cocoa butter, mango butter, cold pressed virgin coconut oil and organic beeswax. Raw Home Essentials has an extensive range of natural products that are easy on pockets and super effective. Get all of these at a steal at LBB Specials.